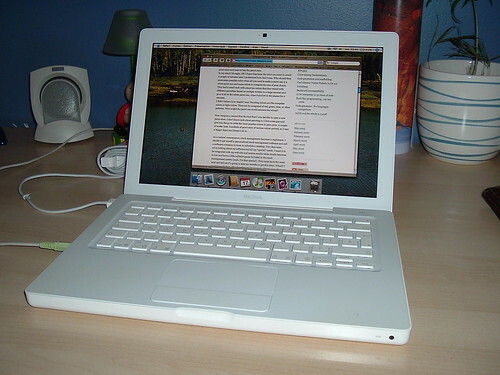 I think that only people with bad taste can argue that a MacBook doesn’t look good. The only problem is that I’m starting to get those yellow discoloration on the bottom plus an ugly stain that wont go away is parked on the right side. But I called Apple and they’ll replace the case without arguing to much. Other then that, it’s true that it get a little bit hot sometimes (up to 80 C on full processor usage). But I still love it! The keyboard feels so good you just want to type all day. Another stupid reason I bought a Mac was to use TextMate. At first I tough I’d miss auto-completion and things like that but I found snippets and commands functionalities much more powerful. Plus, TextMate is fully scriptable in bash, ruby, python, etc. I got to admit that I was largely influenced by other geek around the net, but hey! Why should they have all the fun ? And what are you waiting for ? Go buy yourself Mac !